Featuring one of the most radical bodyboard designs of the era, the Turbo Z was a board that was sure to turn heads! 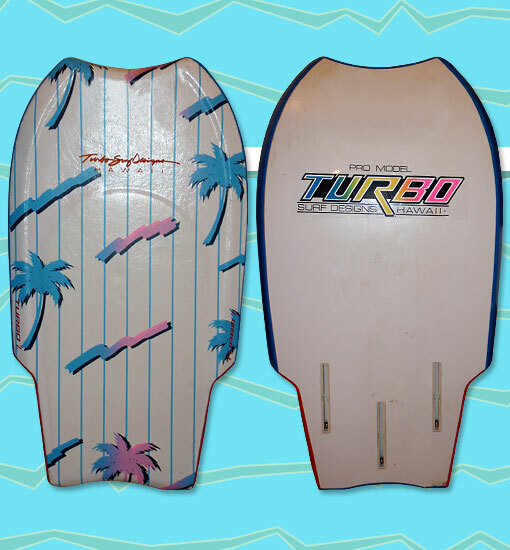 The vinyl deck, Arcel core, and PVC bottom were features common to most Turbo bodyboards, but the Z upped the ante with a hydroplane shape, scoop nose, wingers, a shorter length, and foam padding on the deck for comfort. That was only the beginning - the bottom of the board revealed two-tone rails and an unprecedented three boxes for just about any skeg configuration you can imagine.